A guide to raise the Design, SOP, ERS and HEP ratings of your ship designs. Contracts require you to get a minimum amount of points for each of the four ratings (see screenshot below). The following subsections will show you how the ratings are calculated. Contracts list in the Galaxy View. Keep in mind that some contracts might also require you to use specific rooms! You can find the contract requirements in the Galaxy View in the bottom right, when selecting a contract from the list. (Note that you might have to scroll down). The design rating is determined in the Ship Design. Each room has a specific amount of points for several categories. These points can be viewed in Ship Design when you hover over the room with your cursor. The points summed up will make up the design rating points gained when you place that room on your fuselage. For example, the EM Navigation room will add a total of 200 points to your Design Rating (see screenshot). Tooltip at hovering over room in Ship Design. The Stardard Operating Procedure rating is determined in the Crew Management. The SOP section consists of 5 missions in which a maximum of 60 points can be earned. Pay special attention to the Yellow and Red Alert missions. The way you set up your crew and end the Yellow Alert mission will be the way all the ERS missions start. They way you set up your crew and end the Red Alert mission will be the way all the HEP missions start. The Emergency Response Strategy rating is also determined in the Crew Management. The ERS section consists of 9 missions in which a maximum of 70 points can be earned. These missions mostly focus on natural (space) disasters, like asteriod impacts and fire storms. The Hostile Encounter Program is the final set of missions in the Crew Management. This sections consists of 11 missions in which a maximum of 101 points can be earned. As the name suggests, this section mostly focuses on attacks from hostile forces like other ships, aliens and drones. For all Crew Management missions you can see how the rating for a mission is calculated by selecting it from the list. Close-up of mission ratings calculation. In general manual mission completion will yield better scores than auto-resolve. Auto-resolve is still a very usefull tool though! Once you complete a design you can use 'auto-resolve all' to get a general overview of how well the design performs. You can then still redo individual missions manually to try and improve the rating. Note that if you make any changes to your ship design all scores will be reset. Thus make sure you are confident in your design before doing missions manually. To iterate and improve on your design you can use auto-resolve instead. Example of auto-resolve results in Crew Management. There are two missions in particular that I would recommend doing manually; the Red Alert mission and the Yellow Alert mission. These missions will give you a better set-up for the ERS and HEP mission, respectively. If you do choose auto-resolve for the SOP missions and consequently do some ERS and HEP missions manually, you will not have a nicely set-up crew in those latter missions. Your crew will not be wearing suits, have ammo, or be nicely distributed across the ship. A final remark about mission completion is on the order in which you will do the missions. 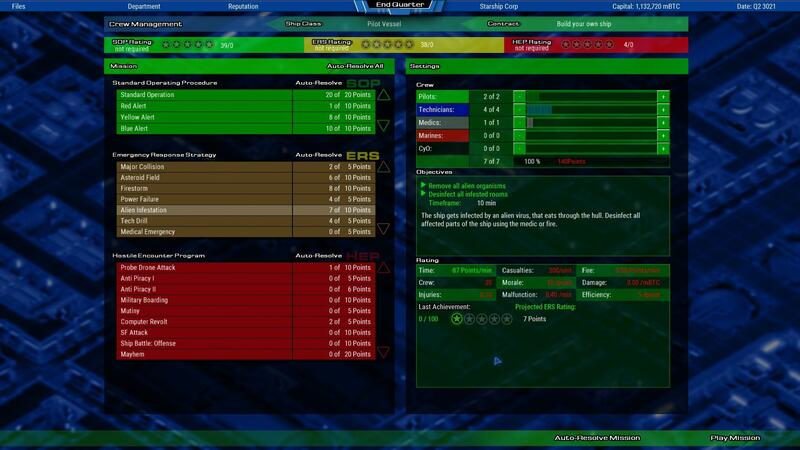 As the SOP missions impact the performance on the ERS and HEP missions, the game will reset some of the scores. This means that you should first make sure you are completely satisfied with the SOP rating before moving on to the ERS and HEP missions. In this section you will find tips to improve your ship ratings through ship design and crew set-up. I won't show you how to perform the missions, so please use to in-game Crew Management tutorial for this. It might take you a while to get through all of them, but they will definitely provide you with good guidance! As shown in a previous section, you can see the design rating you gain per room via the hover-over tooltip in Ship Design. In the table below you will find the rooms which will get you the most Design points. Not all of the rooms are equally eligible for easy Design Rating boosting. For example; in the table you see for that adding a Large Hangar takes up a huge amount of space and is incredibly expensive. If you already have a ship design ready and only need to boost the design rating, I recommend replacing a pilot quarter with a captains quarter. This will be the least intrusive to the rest of you design as it does not take up a lot of space and won't need additional resources. Alternatively you can also replace any of your crew members with Cyos. Do note that adding Cyos will raise the amount of energy needed and lower the amount of air and water needed. If your ship already has an all Cyo crew the previous tips won't help. In that case I can recommend adding the EM Navigation room. For the Standard Operation mission you will need to make sure all rooms stay in good operation. This means that all rooms need to be working efficiently and any mechanical faillures will result in point deductions. It therefore is important to keep an eye on the necessary maintenance crew per room. Room status when selecting a room during a Crew Management mission. For example; the large cooling unit needs 3 technicians for 300 KW worth of cooling. This means that 3 technicians need to present in the room (at the same time) to make it gain efficiency and prevent it from breaking. Alternatively, you could also place three small cooling units which together will also generate 300KW of cooling, but only need 1 technician each. 3 small units will however take up more space and will be more expensive, so its always a trade-off. The Red Alert mission allows you to set-up your crew for the HEP missions. In this mission you should make sure to let your crew put on their suits and get ammo (if you have an armory). It is smart to spread your crew across the ship and let them cover entry points for hostile forces. Hostile forces will usually board your ship via exit hatches, cooling hatches and weapon hatches. In the Yellow Alert mission you will set your crew up for the ERS missions. For the ERS missions it is also a good idea to make sure all your crew is wearing their suit. ERS mission will circumvent damages across the whole ship so spreading your crew across the decks is a good preparation. For the Blue Alert mission all crew needs to evacuate the ship as fast as possible using Emergency Escape Vehicles (EEVs). For this mission it is therefore helpful to place EEVs close to the crew quarters. In these ERS missions you will have to handle impacts at the front of your ship. Therefore you should not place any of the essential rooms at the front of the ship (e.g. the brigde, computer, generators). Rooms which can be safely put at the front include crew quarters (but make sure to move your crew to the back of ship), cargo rooms, water tanks, etc. Alternatively you could also try to protect the front of the ship by placing shield generators. After each hit that causes a hull breach, pause the mission and lock the hatches to the room in which the breach occured. If your crew is at the back of the ship (thus does not get harmed) and no essential rooms break down, you should not have too much trouble to get through these missions and get a better result than at auto-resolve. For these missions it is important to keep your crew spread across the ship. In case of the Firestorm this counts for the whole crew as every type of crew member can extinguish fires. In the case of the Power Failure, Tech Drill and Magnetic Storms missions you should focus more on your technicians as they are the only crew members who can repair rooms. For these missions again it is smart to regularly pause the game during the missions so you can calmly manage your crew and send them out in the most efficient way to deal with the damages. For both the Alien Infestation and Medical Emergency mission it is useful to place your medic quarters(/position your medic) and sickbay near the engine room. The Alien Infestation mission always starts the infection in the engine room. Having you medic near this point of infection will make sure you can quickly send him/her over to start disinfection and preventing further spread. In the Medical Emergency all your crew will get hurt in the engine room due to an explosion. Having a medical facility nearby means you can quickly stabilize them. In the Cyo Malfunction mission, the Cyos will try to take over the ship by accessing the main computer. Therefore it is smart to always place Cyo quarters(/position your Cyos) far away from the computer. Note however that if all your crew is Cyo, this mission will definitely fail, thus you won't have to be bothered with placing the Cyo quarters far away from the computer. For the HEP mission ratings I only have some general remarks as all mission have the same gist of offense/defense of the essentials rooms on your ship. To increase the HEP through auto-resolve you should make sure to add an amory and weapons to your design. Most of the missions will contain an attack of some on the core modules of your ship (bridge, computer), so make sure the critical rooms are not easily accessible from the hatches along the hull.